In stock orders will ship within 2 business days. 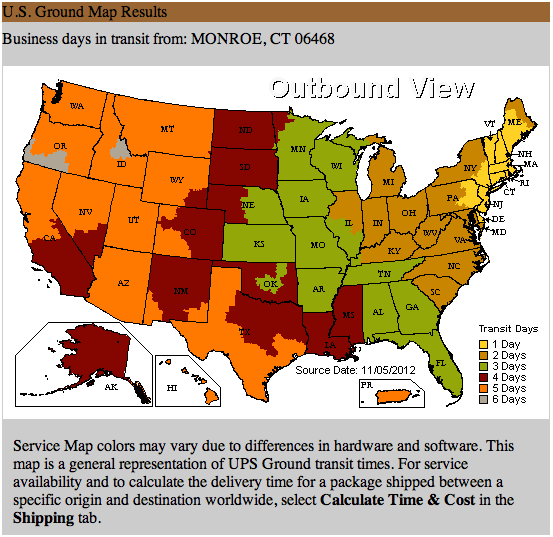 The delivery time is generally one to five days depending on what zone you are in the country. For an estimate of the delivery time please review this map. The map does not account for weekends, holidays and order processing time. If there will be any delays of the delivery we will contact you. We do not ship perishable items on Friday, Saturday or Sunday. UPS does not ship to APO/FPO. Please call us at 1-800 MALTOSE and we can offer you several USPS shipping options. We use the USPS for international shipments. Please call us at 1-203-452-7332 to arrange for the delivery of your international order. Any non-food item can be returned within thirty (30) days for an exchange or refund (less shipping charges). Perishable items including yeast, hops, grain, malt extract and all other consumable ingredients CANNOT be returned. The customer must pay for the return shipping cost unless we have made an error or the item has arrived damaged or defective. Please remember to place your liquid yeast in your refridgerator upon the packages' arrival. The steps for returning merchandise: Call us for a Return Authorization Number Print out and fill in the Return Request Form (attach link) Please make sure that all items are packaged securely Ship package using a prepaid and insured method of shipment. All returns must arrive in new and unused condition for a full refund. Be sure to clearly mark the package with the RMA number as well as including a printed copy of the completed RMA form.